Rung to celebrate UEGCR’s 40th Anniversary. First Quarter Peal in Scotland: 1,2,4 and 6. Last updated Saturday, 9 February 2019 at 21:20:25. First submitted Friday, 8 February 2019 at 23:32:09 by Rachel Frost. 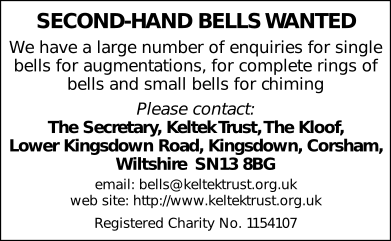 Sent for publication in The Ringing World on Friday, 8 February 2019 at 23:33:14, and printed in one of issues 5627 or 5628.